Thanks to JummyBeg that made a compiled version, you can Download Here! Just unzip the file contents and double click the "run.bat" file to open the IDE. Make sure you have the requirements installed. Unzip the file and double click the GMLCoder.exe. No requeriments installed needed. I was searching for a multiplatform language, and of course the first obvious options was java, but I don’t like the way java doesn't integrate with the Operative system (you know, the custom file search windows, buttons, I think almost everything), so I came to Python, wich is multiplatform and integrates very good with the running OS. Although this is the first ever app I'm making in Python, the learning curve hasn't been too painful and I think this is going very good. I know that GMS 2.0 is coming out in maybe less than a year, so why make another IDE if the new GameMaker is coming with a new one? well I read somewhere in the forums that a guy from the staff said: The drag and drop interface is to stay (Not exact words) and I really liked the paradigm behind Parakeet, no drag and drop, just code, so my plan is to build something similar as that great IDE is discontinued. 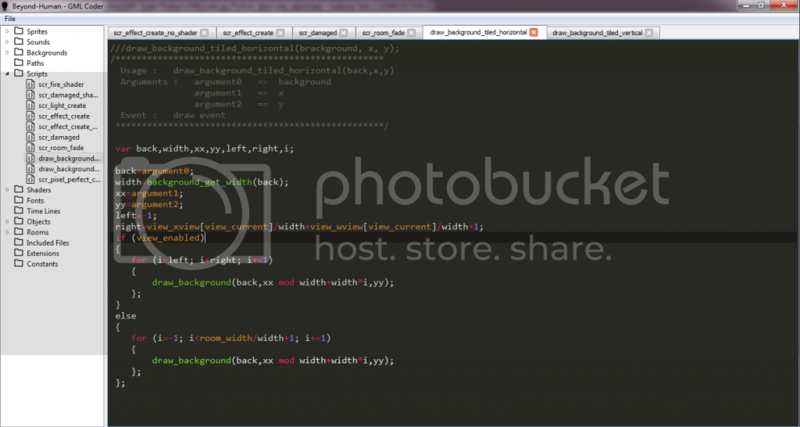 I don't know how powerful Python is at image manipulation, but it's not in the plans to build an image editor. There are tons and very good out there, but if someone gives out a very powerful reason I may consider it. I'm really open for any kind of suggestions from the community, this is at a very early stage and everything we can think of can be done without too much problems. Any ideas you may have for the IDE are welcome and will be highly considered. Well I think that's all for now, let's build some good software together! Edited by eltantillo, 04 October 2014 - 07:57 AM. Thanks for the comment dude the reason to release it at this early stage is to hear to all the ideas and comments that the community may have. That's to try to add as much as possible without the need to turn back to low level code if someone has a great idea. Please if you have the time, check it out and help me trace back some bugs. The highlight system isn't very optimized. I tested the code editor without highlighter and worked smoothly with 300k+ Lines, but with the highlighter enabled, it started to slow down at 75k lines. I have an i5 and 4GB of ram, i would like to know how it performs on other pc's and systems. Edited by eltantillo, 04 September 2014 - 09:27 PM. keep up the good work. It is not usable yet but we need more parakeet like ide's for gamemaker. I dont have the patience for GM's Vanilla IDE. its too bloated. Yeah, that's one of the main reasons why I started this project, I think that as soon as I add support for the objects and shaders it will be usable. Edited by eltantillo, 27 September 2014 - 10:46 PM. This is a great start, and being written in python means its easy to run it on other platforms. Just for curisity, does it support the older GM versions too? Did I Help You? Help Me By Helping Others. Thanks for the compiled version, i'll add it to the first post, what did you used? i meesed up with py2exe, but everything went wrong and at the time I wasn't at he mood. Haven´t tested, do you mean from GameMaker studio? or legacy bersions like 8.1? 8.1 and lower are not supported as they don´t have the xml files that I'm using to parse the game information (The ones generated by GM: Studio). I used py2exe as well, if you'd like I'll send you the setup.py file I used.